The UltraStar® series of strobe beacons are built to last. The polycarbonate dome and aluminium base are impact and corrosion resistant to help extend the life of the strobe. The strobe tube is housed in a vibration-resistant silicone, which absorbs virations and protects the bulb from moisture. 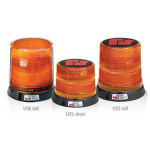 For a variety of applications, Federal Signal's UltraStar strobe beacons come in low- and high-strobe profile models. The optional branch guard provides additional protection.